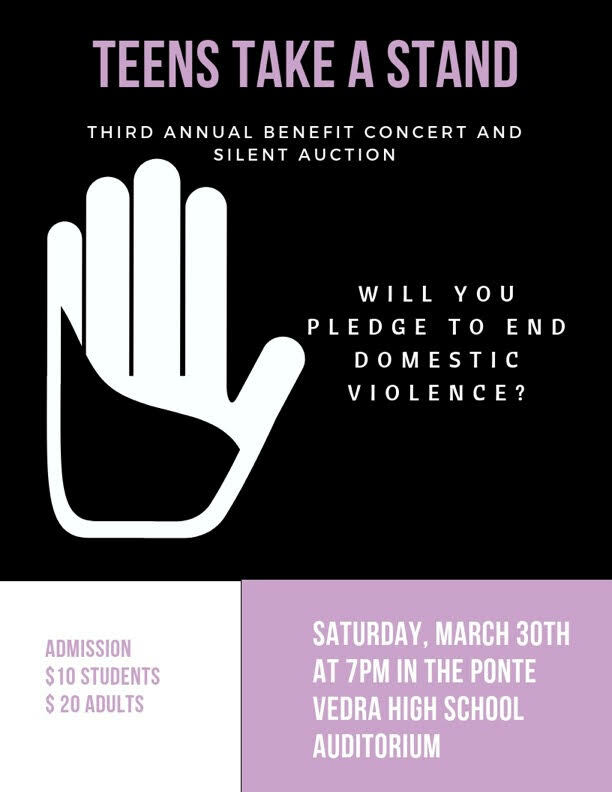 The third annual Teens Take a Stand Benefit Concert will be held at 7 p.m., Saturday, March 30th at Ponte Vedra High School benefiting the Betty Griffin Center and Hubbard House. The benefit concert features a variety of acts – including performers from the Douglas Anderson School of the Arts, Bolles High School, and Ponte Vedra High School. Catalina Alers-Alers from 97.9 Kiss FM will be our special guest MC for the evening. There will also be a silent auction featuring local restaurants, a custom leather jacket, golf foursomes, spa baskets and much more. Most importantly, a survivor from the Betty Griffin Center will share her personal story of abuse. Please join them in their efforts and make a pledge to end domestic violence.